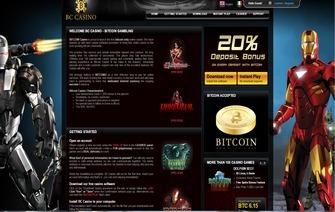 First launched in early 2011, BC Casino set out to be a competitor within the Bitcoin gaming industry, and seemed to start out on the right path. Although it’s cheap site design was a sight for sore eyes, it was effective in how it was approachable, through a player’s perspective. They offered many games throughout the site, and as BC Casino’s popularity grew, they added live dealer features to boost the popularity of the site. BC Casino was able to offer many games of different varieties for players to choose from, from traditional blackjack games to numerous slot games, players who played at BC Casino had an opportunity to choose a game that, most likely, suited what they were looking for. For the first seven to eight months of BC Casino’s existence, they seem to be running a smooth operation and were effective at tactically being able to achieve player satisfaction, through the variety of games, but also through their tremendous support and quick payouts. As the later months of October and November 2012 rolled around though, minor problems turned into major problems and seemingly began the demise of BC Casino. Although BC Casino had a nice beginning, player interaction wise, it seemed to have developmentally been missing a few pieces, from the start. The first example is how poorly designed the site looks, from the homepage. As a poorly designed homepage with an unattractive background, it’s no surprise that some players would have been unwilling to play here simply for BC Casino’s lack of a professional website design. Players complained that the website gave off a “childish appeal” since it’s background contained a floating image of the popular superhero, “Iron Man”. While this is no significant sign of needing to stay away at a particular casino, it did give off the persona that it wasn’t as professional as other established Bitcoin gaming sites. For the first half of 2012, BC Casino seem to stride right easily with the other competitors, in the market, and was positioning itself to be one of the middle-tier places to play, for the time being. Granted, BC casino did not offer quite the selection or nearly the different variation of games that the bigger casinos were able to provide, they were able to do an adequate enough job, with the games that they provided. Deposits and payouts were going smooth while it was nowhere near the popularity of other Bitcoin casinos that were around at the time, a decent amount of Bitcoin had been wagered at BC Casino. Unfortunately, nearing the end of 2012 and starting in the early months of 2013, BC Casino developed into a scam. The owner of BC Casino posted in March 2013 that the website had “shutdown” due to a DDOS attack, but would be up shortly once the problem was solved. As one may have guessed by reading the preceding, the site never came back up, except as a scam. As of January 2015, BC Casino is still being displayed and is accessible for a player to register and play at. Players should be forewarned that although the site functionality is the same as it was when it was a legitimate Bitcoin casino, at this juncture, it is nothing more than a scam and any players depositing Bitcoin, will not receive any winnings back once they place a withdrawal. Bonus 20% on every deposit with bitcoins.